Battling dark knuckles can sometimes leave the person insecure. On one hand, you don’t want people thinking you did it to yourself by bleaching, and on the other hand, you are tempted to use bleaching cream to lighten your joints. Since natural skin tone and bleached skin tone are now in some sort of battle, those who fall in the natural skin but have one trait in common with bleached skin may end up taking unnecessary hits. Dark joints like the knuckles, elbows, toes, knees etc are not always caused by bleaching cream. Some people are born with or later on develop hyperpigmentation, which darkens your joint. There is so much information out there about hyperpigmentation that it always sounds ignorant to my ears when I hear people go on about the only cause being improper skin bleaching. 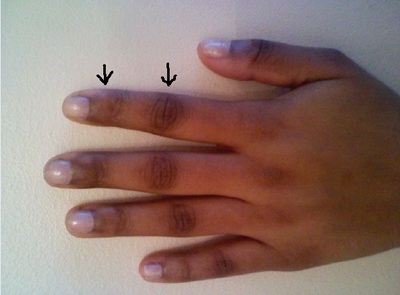 So if a person’s knuckles don’t blend with the person’s natural skin tone, it most times is caused by hyperpigmentation. This condition is very common so it’s not a phenomenon or a code waiting to be cracked. Personally, I don’t believe dark joint or knuckles is the first sign of bleaching. The first sign I believe would be a dramatic change in skin tone. Naomi Campbell one day and Beyonce the next. Keep in mind, weather does affect skin tone, some get lighter naturally when it’s cooler and darker when it’s hot, so when I say dramatic, I mean DRAMATIC change. The most common causes are; it can be hereditary (feel free to thank your parents lol), sun exposure, not properly moisturizing your skin, history of skin inflammation, diabetes, dish washing soaps, taking too much Iron, eczema, psoriasis and a condition called Acanthosis Nigricans. There are ways to reduce the effects at home but if you try these methods and they do not give desired results, you may want to see a dermatologist. The easiest way to get rid of dark knuckles will require a lot of dedication from you. One of the main causes of dark knuckles or joints as stated above is the lack of moisture in the skin around your joints. Because the skin on your joints is thicker, it would require more moisture than other parts of your body. You will need to make sure your joints are properly moisturized at all times. This means, if you do dishes, wash your hands, or do anything that could strip your hands or joints of moisture, you need to moisturize again. If you stay dedicated, you will begin to see changes within a month. Personally, I have had hyperpigmentation off and on for as long as I can remember. Yes, even as a little girl. I have noticed that when I follow the tips above, I see great improvement. The only trick is that you have to keep it up because if you don’t the skin may darken up again. If you do not have time to be dedicated, simply do your best to moisturize your joints and never leave them dry. Lastly, If you suffer from hyperpigmentation, please do not let anyone bully or intimidate you into thinking something is wrong with you. Do not let anyone make you self-conscious enough to start feeling bad about yourself and in turn use chemical highlighters. You can do something to improve the way your hands look but don’t get pressured into using what will harm your skin over time. No disrespect to those who chose to bleach their skin, their life, their choice. Nice session,pls daily tips on how to care for different skin type on my box,thanks. I have same n always tell ppl its natural. I av had dark knuckles since I was a kid.